These days those with the best technology are the ones who win right? Well if you’re a tech lover like I am you’re going to love this guest post by Evil Attorney (a fellow HTPC/SageTV enthusiast). This past Saturday morning I decided to accompany my wife and toddler on their weekly grocery store run, which of course meant taking the Volt. As we parked and got out of the car, a man sprang out of the car next to me, “Excuse me, I know it’s early on a Saturday but I just had to ask you how you like your car.” I replied with standard answer I’ve used with the dozens of others that have approached me with the same question, “I love it. It’s silent, it accelerates quickly, and I have only burned about 3 gallons of gas over the last 1,900 miles.” The man shook his head in disbelief and the discussion turned toward other Volt related talk. Growing up, the electric car represented the holy grail of technology and progress. If you read Popular Mechanics back then, it seemed that affordable, practical electric cars were always just a few years away. But as time passed, the dream of electric cars never truly materialized. That is, until last year when both Chevy and Nissan began selling their 2011 takes on the electric vehicle. I was lucky enough to acquire a Volt shortly after the November release, thanks to a helpful tip on the GM-Volt forums. As a fellow geek and technophile, I would like to share my experiences and impressions of the car so far. 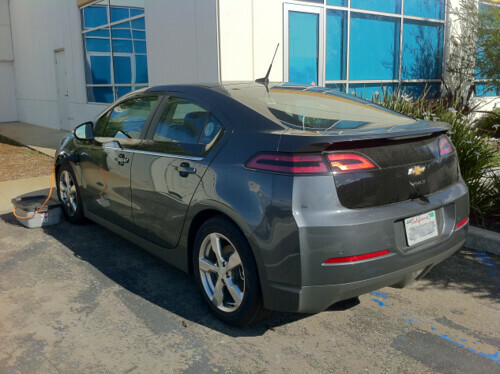 Many of the people I talked to about the Volt assumed that it was either a pure electric or a standard hybrid. Chevy’s confusing marketing slogan “It’s More Car Than Electric” doesn’t help. I’m not really sure what that is supposed to mean. A better slogan might be, “Electric when you want it, gas when you need it”. 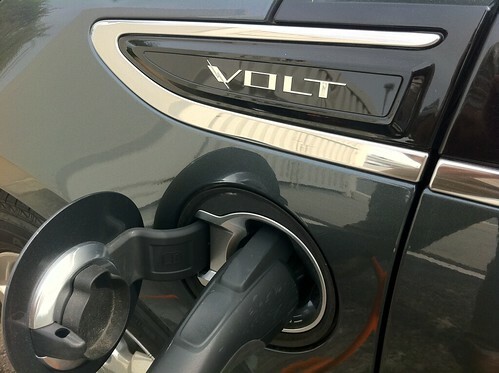 I think the best way to describe the Volt is a range-extended electric vehicle. The Volt’s 16kWh battery and 111 kW/149 hp electric motor will drive you between about 30-45 miles, depending on weather conditions and driving style. If it’s cold, your charge doesn’t last as long. If you peel out of the parking lot like a teenager who just saw The Fast and The Furious, your charge doesn’t last as long. You get the idea. Once the charge in the battery is depleted, the 55 kW/74 hp combustion engine kicks in to maintain the base charge of the battery (referred to as “charge sustain mode”). This allows you to use electric for your local commutes and gas for your longer trips. To add additional confusion, a transmission clutch can selectively engage to allow the combustion engine to directly contribute output to the wheels. However, this clutch is only engaged during moments of extreme torque between 30-70 mph according to an efficiency map in the Volt’s computer. So, at certain rare times the Volt can act like a traditional hybrid as well. However, after two and a half months, I have not seen the combustion engine engage in this scenario. 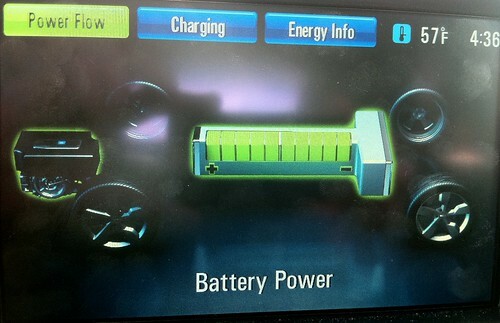 What is it like to drive the Volt? The Volt driving experience is quick, silent, smooth and…well Zen. Depressing the accelerator pedal delivers instant torque in a way that most combustion engines can’t. The Volt’s 0-60 time may not win it any races, but its instant torque makes it feel much faster in every day driving than most midsized cars. It blows the doors off the car I traded in, a 2004 Prius, but that doesn’t say much. The Volt decouples the association between acceleration and the noise/hum/vibration of the engine, leaving only silence. It’s a strange but beautiful thing. I often find myself rolling down the windows at low speeds just to hear how little sound the car makes. Inadvertently sneaking up on pedestrians has become a common occurrence. The handling feels very solid with a low center of gravity. 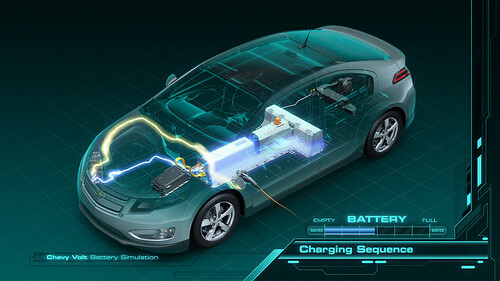 Much of this can be attributed to the 450 lbs T-shaped battery that is positioned in the center of the car, as seen below. The transition from pure electric to the combustion engine in “sustain mode” is almost unnoticeable. The car accelerates and handles identically in both modes. Chevy has also minimized the combustion engine noise considerably. It is difficult to determine if the combustion engine is even on at speeds over 15 mph. Chevy included some fancy graphic eye candy (for a car) to display on two high-resolution, 7” LCD displays. 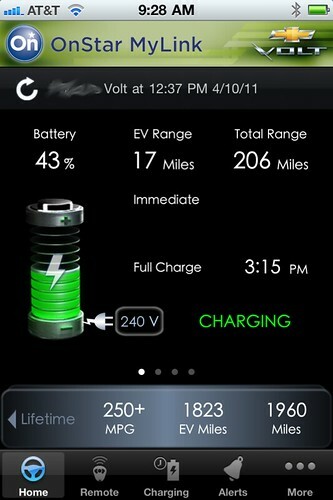 The display behind the wheel includes a large green battery that visually represents the amount of charge remaining. Next to the battery is an estimate of the number of miles that charge will drive you. 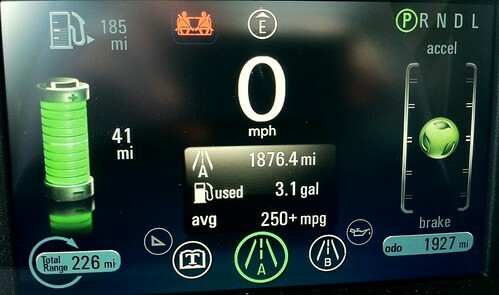 The Volt’s computer constantly monitors your driving style, speed, outside temperature conditions, AC/heat usage, and other factors to keep the mileage estimate as accurate as possible at each moment. Floor the gas or crank the AC and you can see that estimate almost immediately drop. So far, I have found the estimate algorithm to be highly accurate. The green ball on the right is the “driving nanny” that helps guide your driving efficiency. Accelerate quickly and the ball moves upward, turning yellow. Brake hard and the ball drops. In theory, the longer you can keep the ball directly in the center, the more efficiently you are driving. The display on the center stack shows several energy usage screens, audio selection, navigation, climate controls, phone books and similar options. The main energy screen (shown above) displays trip information about how far you’ve traveled on electricity or gas, your trip miles per gallon and your car’s lifetime miles per gallon. 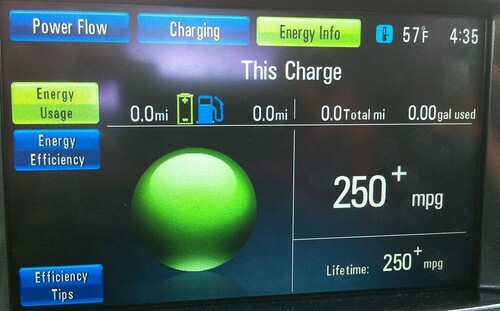 The green ball becomes a pie chart style display, showing a wedge of blue to represent your gas usage for the trip. For the most part, the ball remains all green. 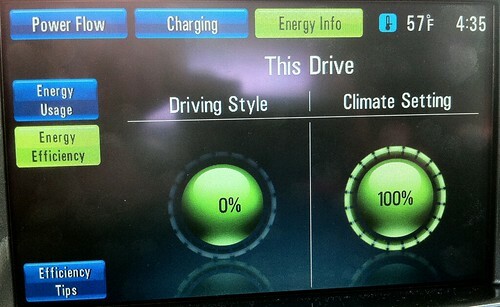 Energy efficiency percentages can also be displayed (above). Since I live in Los Angeles, my climate percentage stays relatively high. The Driving Style percentage requires a bit more effort to keep high. I don’t find the driving style numbers particularly useful, but the climate setting can help you find a good balance between comfort and efficiency. The Battery Power screen (shown above) displays where the power is drawn from to drive the motor. Many hybrids, like the Prius, have similar screens. It looks nice, but is a bit distracting for my taste. 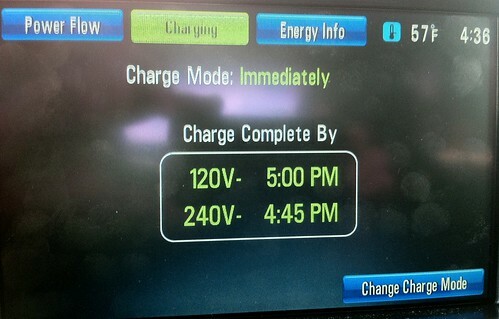 The charging interface (above) indicates when your battery will be charged, depending on whether you use the 120V level 1 charger or the 240V level 2 charger. 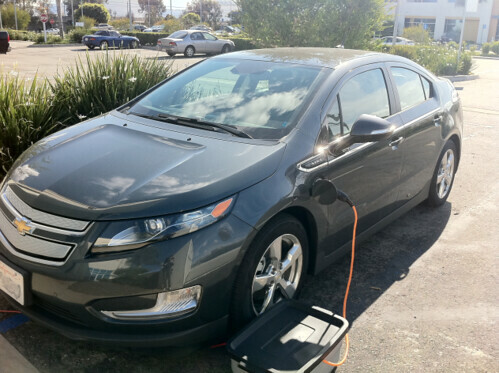 Since many power companies have “time of use” electric plans that provide much cheaper electric rates in the evening, the Volt allows charging to be delayed to any hour or time range you want. The buttons on the center console function by capacitive touch which enhances the overall “techie” feel to the car. I imagine that these buttons could be a problem in colder climates since they will not respond to gloves. Living in LA, I have forgotten what gloves are all about. While I appreciate the aesthetics of the design of the console, I find the functionality lacking. 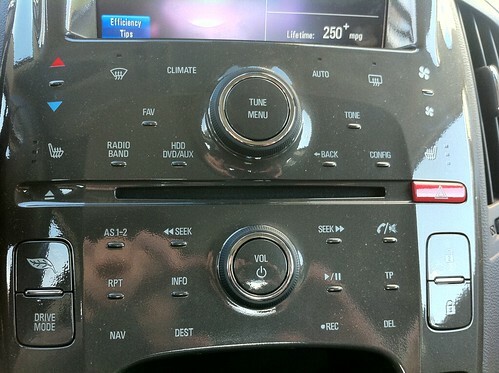 The small font and uniform design make it difficult to find the button you are looking for while driving. At this point, I have memorized where important buttons are located, but I had a few frustrating moments hunting around for the right button while on the freeway. The Volt comes equipped with a Bose Energy Efficient Sound System which is supposedly 30% smaller, 40% lighter and uses 50% less that “conventional” sound systems. It’s not clear to me if this is marketing puffery, but at the end of the day, the sound is very good for a stock audio system. Like many car stereos these days, it has a hard drive for pausing live radio (for a short time) and copying CDs. I am told that the system will play video DVDs when parked, but I have not tested this feature out. 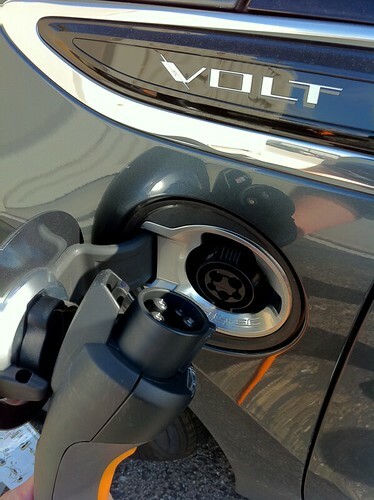 The Volt uses the industry standard J1772 style charger plug (seen above) for providing Level 1 charging power (120V) or Level 2 charging power (240V). The charger/plug communicates with the car, ensures there are no shorts, then starts delivering power. The J1772 standard is designed to allow a user to safely plug in during rain or snow without problems. I have charged in the rain on 5 or 6 occasions without any problems or charge interruptions. 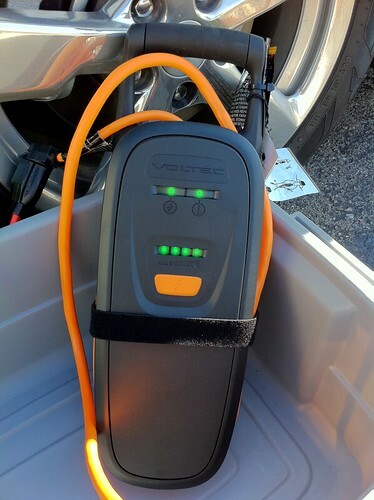 The Volt comes with a small level 1 charger that fits in a recessed space in the trunk. I keep mine in a small Rubermaid container when in use to help keep the dust and dirt off of it. The level 1 charger plugs into any standard outlet and will charge the battery in about 10 hours. Level 2 chargers must be custom installed in your home, but only require about 4 hours to top off the battery. Most home chargers are between about $400-$1,000 and installation usually runs about $2,000-4,000, depending on how much work is required. There are some great government tax credits for these installations, depending on which charger you choose and where you live. I have been qualified for a free level 2 charger from Coulomb and about $1,000 credit from the state of California. I am still working on installation of a level 2 charger. The nature of my home (a high-rise condo) has raised numerous technical and administrative issues (e.g., where does the power come from, how is metered, how will it be billed, will the condo association own my charger, does the building have enough power to supply many of these types of chargers, etc.). Presently, I am only charging at work with my level 1 charger. My boss is kind enough to let me run an extension cord out the back door. Locally, there are few public level 2 chargers available for use in the LA area. So far I have charged at two public chargers, one at the Staples Center garage (caught a Clippers game) and the other was in the public garage at Santa Monica Place in downtown Santa Monica. The electricity at both garages was free, which is a nice perk while it lasts. 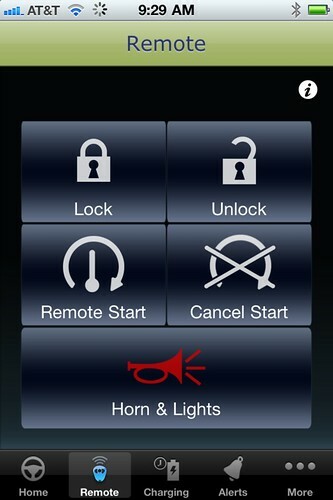 Charging can be remotely monitored via Chevy’s OnStar app for iPhone or Android. The main screen shows your actual battery percentage, the estimated electric range, mpg statistics and the estimated time charging will complete. 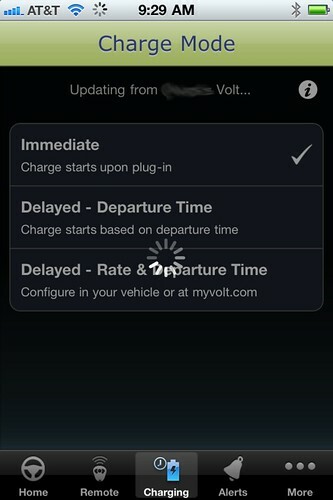 You can also modify your charging mode (e.g., immediate or delayed) or remotely lock or start your car. I have found the alerts feature of this app to be the most useful so far. OnStar allows you to set email or text message alerts if you forget to plug-in your car, the charging is complete or the charge has been interrupted. Since I leave my car plugged in the back of my work all day, I especially appreciate the interrupted charge alert. If someone accidentally kicks my cord out of the outlet or is otherwise messing with my car, I’ll know. The number that made me the most nervous about the Volt was the 37 mpg rating when in gas-only, charge sustain mode. Coming from a Prius that consistently achieved 48-49 mpg, I worried that that my mpg could be severely downgraded. After driving almost three months (since January 23), I can safely say that my gas mileage has been dramatically increased. Since taking delivery, I have driven slightly more than 1900 miles and used 3.1 gallons of gas. That works out to over 600 mpg. Chevy doesn’t even bother displaying mpg that high in the car itself, opting instead for 250+ mpg. With relatively conservative driving (gradual starts and stops) I can typically achieve about 42 miles per a full battery charge. That number will drop to about 35 miles or so when driving more aggressively or at a faster speed (over 65 mpg). It’s also important to keep in mind that gas usage can widely vary based on your typical driving scenario. My commute to work is exactly 15 miles away from home. Therefore I can drive to and from work on a single charge and have a little left over for nearby errands. Long commutes would probably do better with a Prius. My rough rule of thumb is that if the entire trip is longer than 135 miles, the Prius would burn less gas. Also note that if I was driving a Nissan Leaf it would not be possible to drive that distance since its maximum range is about 100 miles. My electric rate at work is $.09/kWh. Assuming 93 electric miles (27.9 kWh * $.09 = $2.51) and 7 gas miles ((7miles/37mpg)*$4.20/gal = $.79)), the total cost is about $3.30. This gas savings probably isn’t enough to fully offset its higher price tag compared to many midsized vehicles ($32,780 after the $7,500 tax credit). But as gas prices increase, manufacturing is expanded and the technology is improved, it is easy to see how this type of car could become a better value. At this point you are paying an early adopter cost for the luxury of using two different fuels with the same car. At the end of the day, the Volt is fun, well-engineered car to drive. I don’t think I could go back to a standard hybrid or combustion engine car after this. The next few years should be very interesting as Chevy refines the Volt design and other car companies jump into the electric transportation market. About the author: “Evil Attorney” is a gadget enthusiast who uses SageTV for his Home Media and TV system. This is the first of hopefully several articles about tech he uses.